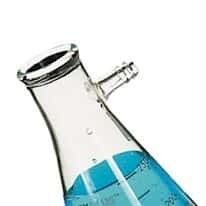 Filtering flasks (also known as a vacuum flask, filter flask, or Büchner flask) has heavier walls than a standard Erlenmeyer flask to withstand the effects of vacuum filtration. A side arm with hose barb end accepts flexible tubing for connection to vacuum pump, aspirator, or house vacuum. During filtration, the filtrate enters and is held in the flask while the sample or residue remains on the filter paper in the funnel. Filter flask can also be used as a vacuum trap in a vacuum line. Choose from borosilicate glass, safety-coated glass, or one-piece molded polypropylene; some flasks feature permanent graduations. Also available as a filtration assembly, complete with filter flask, funnel, stopper, and support clamp.